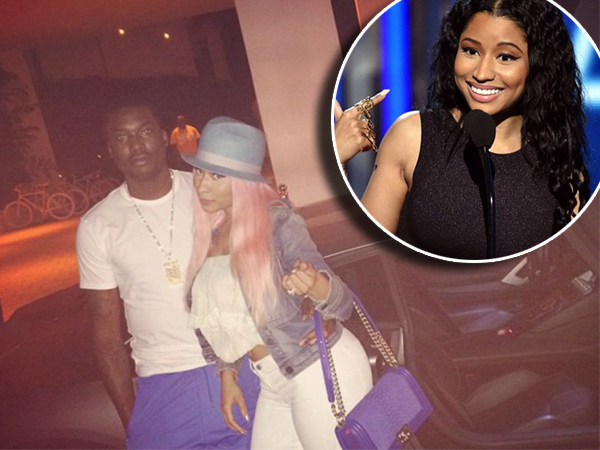 Nicki Minaj seems to have announced she is engaged to marry Meek Mill. Rapper Meek, real name Robert Rahmeek Williams, confirmed via Instagram last week that he and the 32-year-old Pink Friday star are dating after months of speculation. And it appears the couple may have taken their romance to the next level after Nicki posted a cryptic message on her Twitter account Wednesday. The post starts off with three emojis: a diamond ring followed by a yellow heart and a diamond. “I’ll post it later,” the tweet reads, closing out the message with a tongue emoji. Just a few hours earlier, Nicki shared what appears to be an iPhone snapshot on Instagram. The cute image features a picture of Nicki with a text message below that reads: “How I was lookin at u last night (sic)”. This precedes a picture of Meek, with a text message below his face that reads: “How I look at u sometimes lol (sic)”. This interaction seems to allude to a private conversation the enamoured couple may have had recently about how to move forward in their romance. Meek (27) has also taken to social media this week with similar enigmatic allusions. On Monday he posted a tweet featuring a lone yellow heart emoji, the exact same one Nicki shared with fans today on the micro-blogging site. On Wednesday Meek shared a picture of himself on Instagram, with a caption that reads: “Almost…..”. Rumours first began circulating they might be betrothed after Nicki shared a photo of her and Meek embracing one another via Instagram on Tuesday April 14. It seems like a normal couple-in-love photograph, but this image is striking because Nicki is seen with a huge, gleaming band on her left ring finger.